Donald Trump and Kim Jong-un. 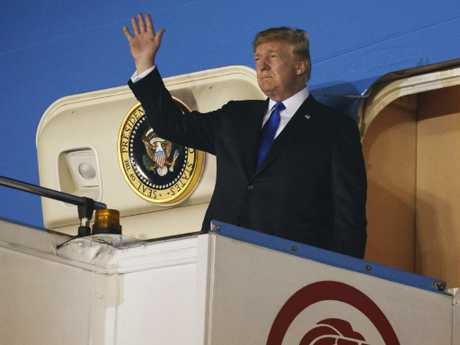 US President Donald Trump will meet with Singapore's prime minister today ahead of tomorrow's summit of the century with North Korean leader Kim Jong-un. The working lunch will give President Trump, who prides himself on his negotiation skills, some last minute insight into how Mr Kim is viewing tomorrow's meeting. 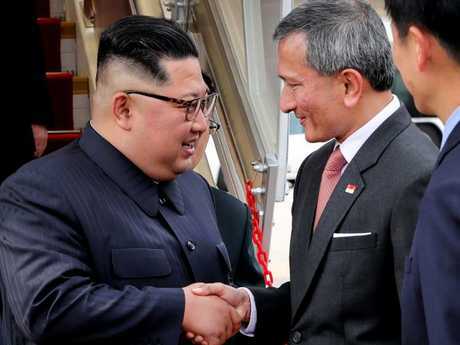 Singapore Prime Minister Lee Hsien Loone spent some time with the North Korean dictator when he landed yesterday afternoon. "The entire world is watching the historic summit.. and thanks to your sincere efforts.. we were able to complete the preparations for the summit," Mr Kim told Mr Lee last night. Final logistics for the sitdown will be nailed down today at a meeting in the Ritz Carlton between the US Ambassador for the Phillipines Sung Kim and a North Korean delegation at 10am local time, according to White House spokesperson Sarah Huckabee Sanders. 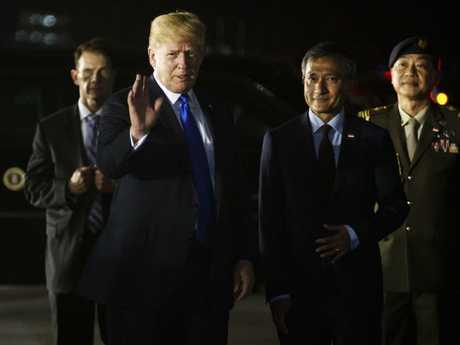 On the back of a fired-up confrontation with some of his closest allies, Mr Trump arrived in Singapore last night for his historic sit-down with Kim Jong-un. 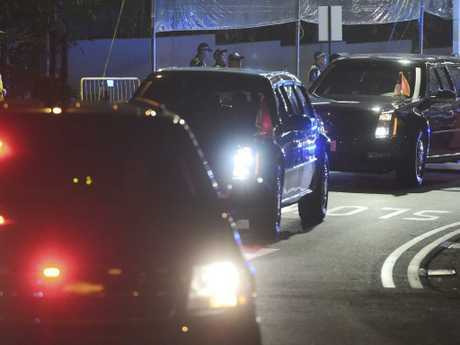 Mr Trump landed on Sunday evening at 8.21pm (10.21pm AEST) at the island city-state's Paya Lebar Air Base, travelling from Canada, where he attended the G7 summit. Mr Trump said he and the North Korean leader have a "one-time shot" at changing the course of history. Describing the meeting as "a mission of peace", Mr Trump said he was speaking for the "hearts of millions of people, people from all over the world" to try to convince Mr Kim to give up his nuclear capabilities. Mr Trump will become the first sitting US president to meet a North Korean leader, and the summit comes after months of escalating threats and tension between Pyongyang and Washington. Mr Trump said yesterday he would quickly know by "my touch, my feel" how the meeting would turn out. "I think within the first minute I'll know," he said. "If I think it won't happen, I'm not going to waste my time. I don't want to waste his time." He said he felt positive about the summit, but acknowledged "it's unknown territory, in the truest sense". "This is a leader who really is an unknown personality. People don't know much about him," he said of Mr Kim. After Mr Trump left the G7 summit, where he had faced pressure from Germany, Canada and France over recently announced tariffs he is pursuing under his "America first" platform, Mr Trudeau described them as "insulting" and said he "will not be pushed around". Mr Trump blasted his Canadian counterpart on Twitter, saying Mr Trudeau had "acted so meek and mild" but was "very dishonest & weak". The war of words puts the American president in the unlikely position of walking into tomorrow's bilateral on better footing with a dictator than with some of his closest allies. 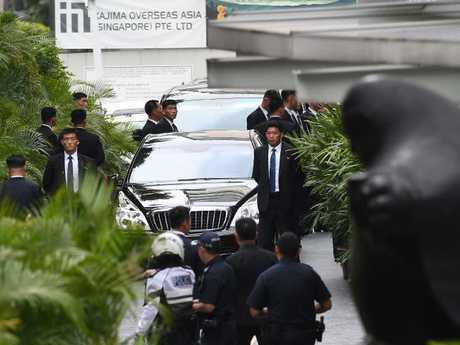 The two leaders arrived yesterday to an unprecedented security presence in Singapore, which has paid $20 million to hold the hastily arranged, on-off summit. Half of that figure is being spent on security, according to Prime Minister Lee Hsien Loone. After touching down in Air Force One, Mr Trump travelled straight to the five star Shangri La Hotel, ahead of meeting Mr Lee today. 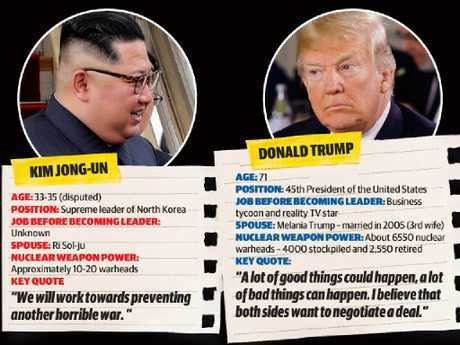 North Korean Leader Kim Jong-Un and US President Donald Trump. 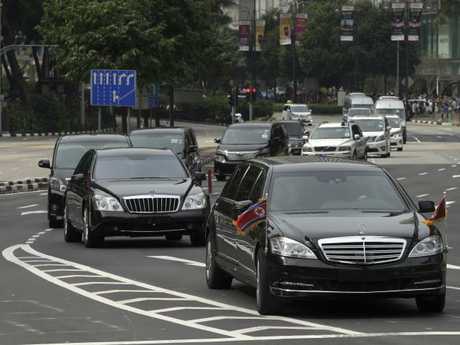 Mr Kim landed yesterday afternoon on an Air China 747 and was driven by stretch black Mercedes in a motorcade with fleets of police motorcyclists and emergency vehicles, along blocked off roads to the St Regis Hotel. 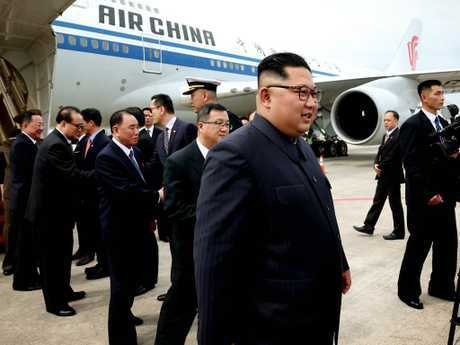 His decision to use an Air China flight comes hours after the airline announced flights would be resuming to North Korea. It sent onlookers into a frenzy, after the North Koreans reportedly sent two decoy planes in an attempt to avoid an assassination attempt. Mr Kim also arrived with his army of bodyguards jogging alongside him once again. The North Korean leader's security detail was out in full force shortly after Kim's plane landed in Changi Airport. Video showed the men, dressed in black suits with blue-and-white-striped ties, jogging alongside a black vehicle with tinted windows carrying Kim. The bodyguards caught worldwide attention during the inter-Korean summit in late April when the suited North Korean men were spotting trudging along in a similar bizarre scene that was spotted Sunday. 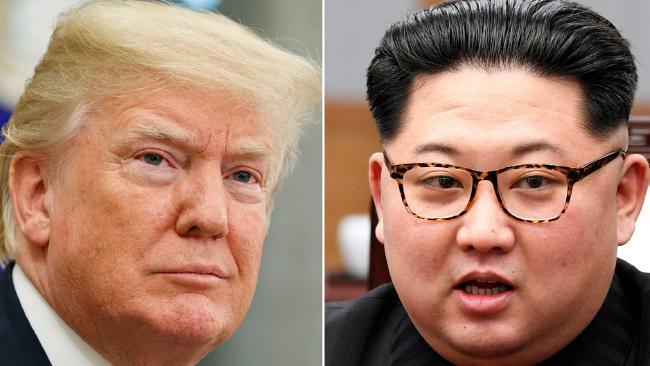 Mr Trump has repeatedly said he is seeking "complete verifiable and irreversible denuclearisation" and US Secretary of State Mike Pompeo last week said Mr Kim had indicated he was open to this option. But there is widespread doubt Mr Kim, who will be arguing for the removal of crippling sanctions, will volunteer the arsenal with which he has grown North Korea into a certified nuclear power. More likely will be a formal peace treaty ending the seven-decades old Korean War. Mr Trump said Mr Kim had a "one-time shot" to get what he wanted out of the meeting, which was "unknown territory, in the truest sense". "But I really feel confident. I feel that Kim Jong-un wants to do something great for his people, and he has that opportunity. And he won't have that opportunity again," Mr Trump said. 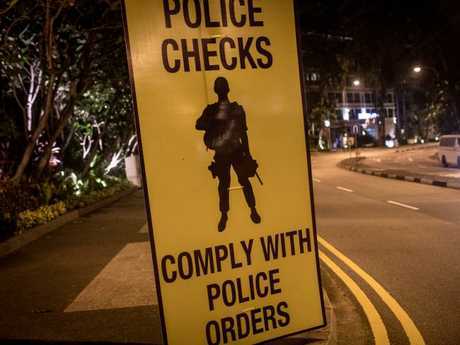 Singapore has been transformed into one of the world's most secure zones ahead of tomorrow's historic summit between Donald Trump and Kim Jong-un. Heavily armed Gurkhas and anti-terror squads are on patrol and entire city blocks are closed around the hotels where the leaders are staying. The wealthy city-state has spent more than (SGD) $20 million and deployed its biggest security force in more than a decade, including 23,000 officers on land and naval ships patrolling the coast. 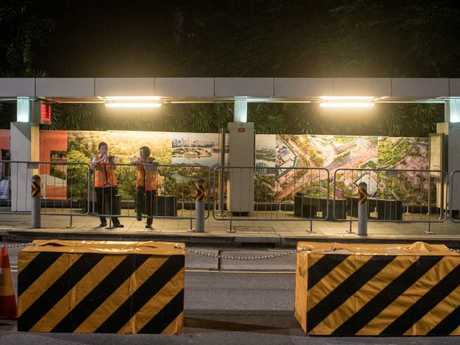 The expat island enclave of Sentosa, home to the Capella Hotel which is hosting the summit, has been locked down, with visitors needing to show identification or proof of their hotel booking in order to enter the declared "emergency zone". Prime Minister Lee Hsien Loong yesterday declared the city was ready. "I am sure that we will be able to show what Singapore can do," he said. Singapore's reputation for strict law and order was one of the key reasons it was chosen for the summit. The nation - which is footing the bulk of the costs - is also one of few with diplomatic ties to North Korea. Mr Lee conceded the summit was taking up "a lot of money, a lot of people, a lot of effort" but described it as a "a plus for Singapore". He said half the $20 million cost was going to security. "I think it is a cost that we are willing to pay, and it is our contribution to an international endeavour which is in our interests," he said. 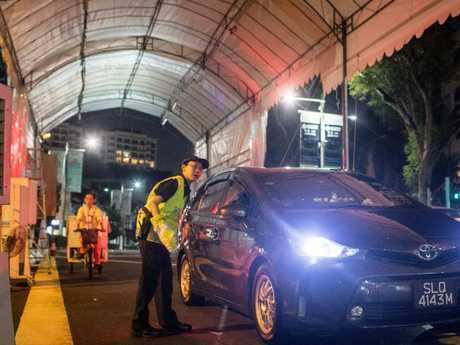 Although Singapore has hosted many international events, some of its 5.6 million locals were yesterday baulking at the traffic pressures and inconvenience. 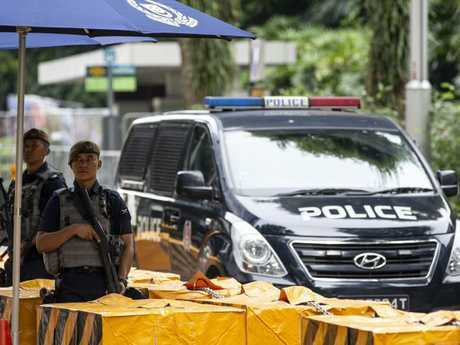 "I do know it's an important event, but we also need to raise our families here and go to work, and they are making that hard with all of this security," said expat Australian executive Michelle Lowe on Sentosa's Palawan Beach yesterday. Tourists Lee Helvey and his wife Sally, who were swimming nearby with their children on the beach which marks the southernmost point of Continental Asia, said they hadn't known the summit was happening when they booked a weekend away there. "There is a lot more security than we thought there would be but it's for a good reason," he said. Under the declared special event zone in place from June 10 to 14 in some pockets of the city, several items are banned, including drones, weapons, flares, banners and loudhailers. Mr Trump ultimately wants North Korea to commit to "complete verifiable and irreversible denuclearisation" while Kim seeks security assurances and normalised relations with the US that would result in economic development for the impoverished North. No one leaves early. Former U.S.-Korea negotiator Robert Gallucci said last week: "That no one goes home early because of what the other side said or did". And they agree, in general, to continue negotiating. Define denuclearisation: A clear definition of what it means to denuclearise North Korea would be a clear win for Trump. But that definition should describe the removal of the North's nuclear weapons and components, all its nuclear fuel, and its production capacity for that fuel. Progress needs to be made to gulf the difference between what the US considered denuclearisation and what Pyongyang was seeking, which was the removal of American nuclear weapons from South Korea. A workable starting point: The best possible and realistic outcome for the summit would be "a general statement that identified denuclearisation as an end goal of a process to be determined," said Suzanne DiMaggio of the New York-based New America think tank. Such a process would find a middle ground between what the two sides want. The North Koreans seek a peace agreement, normalisation of relations with the U.S., security guarantees and sanctions relief, while scaling back their nuclear program incrementally in return for these U.S. concessions over a long period of time. The US started out saying it wants North Korea to destroy and dismantle its nuclear program first, and then get all the benefits, but on Friday Trump said repeatedly that there's a process ahead. Agree on inspectors: Past rollbacks in North Korea's nuclear program occurred when international inspectors were on the ground to verify them. The "best" diplomatic era between the US and the North was in the 1990s, when the country's government allowed inspectors who witnessed frozen facilities and a halt of construction on two reactors, which permanently limited plutonium production capacity, according to a Stanford University history of North Korea's march toward nuclear weapons. The whole international community is strongly looking forward for the United States-North Korea summit to open doors toward peace and stability of the Northeast Asia. A formal declaration to end the war between North and South Korea.